From June 22nd to 29th, the international EMS Mission Council met in Korea. After a few weeks of intense preparation and two days at the airport most of the delegates had safely arrived. The first days were filled with an exposure program in Seoul. The 24 delegates went to the Museum of War and Women's Rights, visited the monuments of the uprisings for democracy on April 19, 1960 and May 18, 1980 in Seoul and Gwangju, and participated in the Monday prayer for peaceful reunification on the Korean peninsula. On Wednesday, the group went to Gwangju, where the Mission Council was meeting until Sunday. 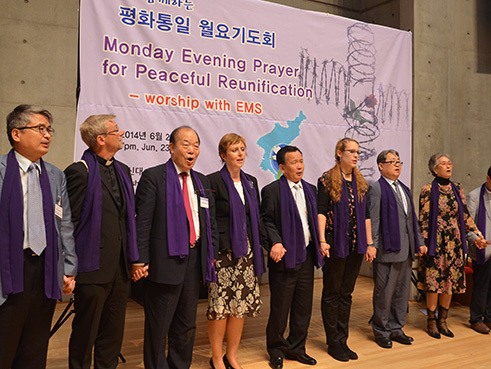 While I was in charge of the program in Seoul and was also allowed to lead the Monday prayer, the PCK - quite ecumenical - took over the lead in Gwangju. On Sunday, the delegates were sent to different PCK and PROK congregations. For the first time during my 2.5 years in Korea I visited a PCK worship service and I was able to experience that it does not differ from the PROK services at all. I guess, this could be called ecumenical learning. After the services, it was already time for departure. On Sunday we accompanied some delegates to the airport at dawn and in the late evening and on Monday we saw off the large group of German delegates.